Jodi Yambor earned six individual All-American honors and nine as part of relay teams during her Hurricane career. She won consecutive national championship titles in 1976 and 1977 as part of the 200 meter medley relay team that set new American records each year. 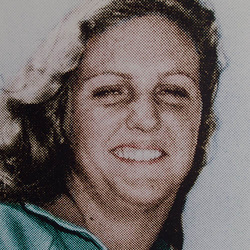 Jodi placed sixth in the nation in the 50 meter freestyle(:24.55) at the 1977 Association of Intercollegiate Athletics for Women (AIAW) Championships and helped lead the Hurricanes to back-to-back national championships in 1975 and 1976. Jodi served the UM athletic department as a performance enhancement specialist through the late '80's until the early '90's. After completing her M.S. and Ph.D.at Florida State University, Dr. Yambor returned to UM to coach swimming and work as a sport psychology consultant for the athletic department. She became the first sport psychology consultant employed full time by an NCAA colligate athletic athletic department. Dr. Yambor worked primarily with football, women's basketball, tennis golf and crew. In 1990, Jodi was chosen as one of the sport psychology consultants for the U.S. Track and Field team.